The event took place at The Chicago School of Psychology in Chicago, Illinois. It was my second time in Chicago and I forgot how amazing the food was, so yes I ate well. The conference was split into two tracks: First-Timers and Alumna. All attendees were together for the morning/evening Keynotes and lunch. Then we split into our two tracks and attended “workshop-style” sessions in various areas surrounding writing, speaking and coding. The conference is open to all who identify as women. Their mission is to empower women developers to become thought leaders, conference speakers, and open source contributors. 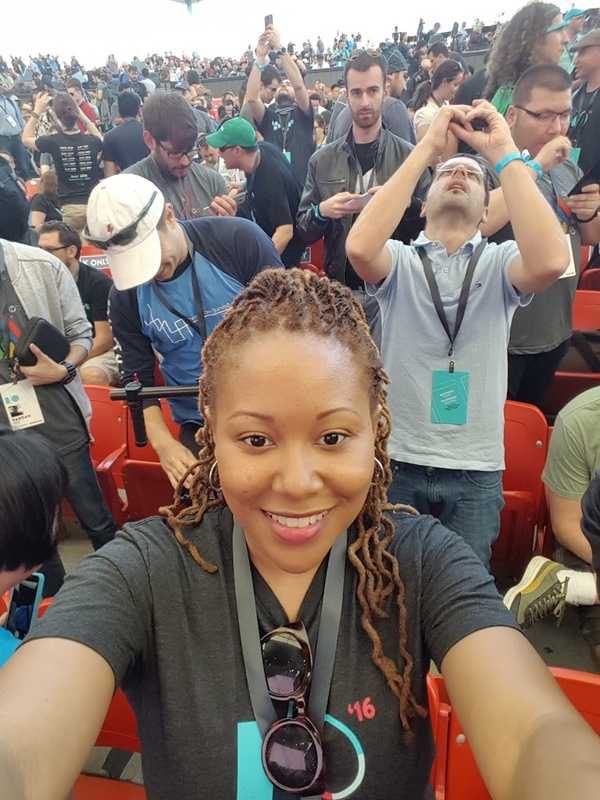 So the experience level was across the spectrum, many women were just entering the field and others were very experienced developers. So it was great getting to interact with such a diverse group of talented people. Did it answer all of your questions? What new questions came up for you? I also really enjoyed the information shared during the “Salary Negotiation” talk. Ashley Powell showed how men and women often negotiate differently and that leads to men consistently making more money than women even though they have the same experience. So it was great to see ideas for how to negotiate when you’re job hunting as well as when you’re looking for a raise. One thing that really stuck with me was that you don’t have to be “aggressive” to negotiate, just go with what works with your personality. Whatever you do, it doesn’t hurt to just ask! With all the information that was being shared during the conference, I appreciated the fact that I still had time to step away and grab some ice cream with a good friend. This was my first time attending an all women conference and it was just as many have said before a transformative experience. I left feeling empowered to do even more great things and to be okay with doing nothing at all. So the event took place at Shoreline Amphitheatre in Mountain View, California. It was my first time in Mountain View and it’s such a beautiful city. On Day 1 of the conference it was a bit “toasty” outside so that proved to be challenging, but eventually the remaining days were pleasant and breezy. The majority of the talks took place inside tents and there tended to be a lot of interest on the part of attendees. For me one of the best parts of attending I/O this year was getting to meet so many of the people that I have interacted with online. Most of them were really cool people and managed to keep their spirits up despite putting up with the heat and long lines. I was completely impressed with the updates to Android Studio. Some of the things that I felt would be nice to haves, like showing Gradle dependencies clearly or having the Espresso Test Recorder were released. Definitely one of the major highlights for me. Also there were several talks on developing applications for emerging markets. I especially enjoyed the one titled, “Building for Billions”. The speakers talked about the best strategies for making sure your application is always interactive and responsive for users regardless of network and memory conditions. All in all, I am very thankful I was able to attend; I know that everyone doesn’t get this opportunity. I learned a lot, I drank a lot of coffee, and I met some awesome folks.